The other day I posted on Facebook that I had roasted chick peas and they were amazing and a friend dared to accuse me of knowing how to cook! Paula Deen would fall in her turkey fryer if she read that. I will admit only to being an efficient (lazy) food preparer/combiner. But it works and I have figured out how to crank out some pretty yummy stuff. I used to have a pretty typical American eating habits. It took a trainer literally years to convert me (and I still have room to grow) but in that time I've learned how to make it work for me, which means easy and efficient. As an industrial engineer with degrees in triplicate, I am all about efficiency. My trainer, Kurt, recently wrote a great blog post on Basic Nutrition where he included a list of quality food sources he uses, categorized as chiefly sources of protein, fat, carb, or fiber. It's a must-read post. I eat nearly all the foods on his list and not many additional. I think they are pretty typical foods among folks who eat for health, performance, and to just feel good! I mix and match those food sources from the four categories as needed. I figured I'll share my personal application of the system that might help other time-crunched folks who don't have lots of time to spend in the kitchen. All of my meals involve some combination of protein, carbs, fiber, and fat, with proportions adjusted for fueling needs. For instance, it's more carbs before workouts, less later in the day, less fiber before a race, that sort of thing. I'm still working on that part. Meals 1 and 6 are nearly always the same: steel cut oats + almond butter + fruit for meal 1; casein + peanut butter + oats/granola for meal 6. That means I only have to think about four meals. 3 of my 4 other meals include lots of veggies, the 4th meal is usually something with dairy - either cottage cheese or greek yogurt. I seem to crave that one serving of dairy is all. Chicken breasts: put on baking pan, sprinkle with McCormick seasoning of choice, bake. Put in fridge to cool overnight. Once it's cool it's easier to chop. I use a food chopper to finely dice. Then I freeze it in 5 oz portions in bags (approx. 2 servings). Lean ground turkey/beef: cook in skillet, pour off fat, add water to release more fat, drain again. portion and freeze. Alternative: put into muffin pan to make little "meatloaves". These chilled meatloaves can be sliced or diced too. I also cook, portion, and freeze my carbs. Brown rice, quinoa, and barley are my favorites. They all freeze just fine. Once or twice a week I roast up veggies. Translation: I put veggies on a baking pan, spray them with olive oil, add salt, and stick them in the oven at 350 (the default oven temp!). My favorite things to roast are: diced butternut squash, diced sweet and/or red potatoes, brussels sprouts, broccoli, asparagus, cauliflower, spaghetti squash, eggplant, peppers....OK, you get the idea. I keep some store-bought frozen veggies around too and always have fresh spinach, broccoli slaw, and shredded carrots on hand. You can roast or bake lots of things. The two more strange ones I have done are the roasted chick peas and kale chips. 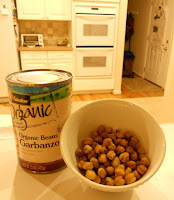 The chick peas (canned - rinsed and drained) come out crunchy on the outside and give a sense of popcorn. Kale chips involve removing stems, washing and drying the leaves, spraying them with olive oil and adding cajun seasoning. Bake till crispy! They are SO SO good I can eat an entire huge bunch of kale in one sitting in this way. Beats scarfing down a bag of Doritos, right? Texture is a big thing for me, I tend to like things shredded, diced, and generally chopped. A big slab of meat or whole potato is a lot less appealing, but that's just me. To each his own. This is the fun part! In my freezer I have my protein and carbs, in my fridge my fiber. The fat is either in the protein or added as flax meal or oil or nut butter. I pull out my ingredients, give them a quick warming in the microwave, and start assembling. So you get the picture. I call it the "Garanimals" of food systems, just mix and match. Keep it simple and make it work for you. I have a number of other posts under NUTRITION that include other easy food combos. The big key is to have fun with it and experiment. It's all about enjoying good whole foods and reaping the performance rewards (and feeling good) that go along with it. P.S. I just discovered my camera has a "food" setting that I used for the above picture. How funny!